Original Exfoliant Foot Peel Baby Foot is designed specifically to remove hardened skin and dead cells from your feet. It's effective, effortless and very simple to use. 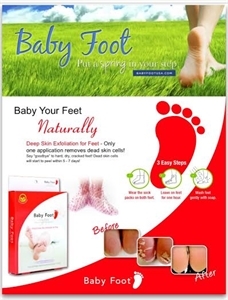 Finally there's a product that gives fantastic results with a single use treatment Baby Foot Easy Pack is a Japanese product that has been on the market for 15 years and is now the best selling foot care product in Japan. It has been specifically designed to easily remove those dead skin cells that cause problems to your feet. Thanks to Baby Foot, its 17 Natural Extracts will not only peel off the dead skins cells, it will provide you incredible moisturizing power and will help maintain your skin's texture. The main ingredient is fruit acid (collectively referred to as Lactic Acid, Glycolic Acid, Apple Citric Acid and Citrus Acid which are fully contained in fruit). It has been used as a folk remedy for the elimination of bacteria, inflammation and psoriasis for several hundred years. Currently, you'll find these ingredients being used in cosmetics and bath salts because it's safe to use, effective and has the ability to remove bad odor. Baby Foot is simple to use, effective, effortless, and after 5-7days, the dead skin cells will start to peel off and the skin on your feet will be as fresh as a baby's foot.